Boiling Point Blog: Feminist, LGBT and progressive political cartoons: Reminder: "Attack of the 50-Foot Mikhaela" and "Deep Doodle"
Reminder: "Attack of the 50-Foot Mikhaela" and "Deep Doodle"
Bushies are bum-rushing Cheney’s secret bunker! Ex-gays are quaking in their closets! Abstinence educators are shivering in their shiny silver purity rings! Greedy CEOs are heading for the hills and Minutemen are bolting for the border! Cartoonist Mikhaela Reid is on the rampage—and no hypocrite is safe! Attack features 150 of Reid's greatest cartoon hits, plus rarities, odds, ends and behind-the-scenes commentary! Available June 4 at Lulu.com! Masheka Wood takes you deep into the warped, candy-colored recesses of his brain as he tackles a variety of social, political and just plain grody targets. 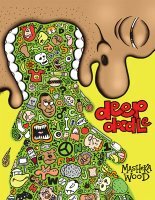 Here are Wood’s “Not Just Knee Deep” cartoons, assorted illustrations and a delicious dose of old-school comics. Prepare to lose your mind—or your lunch! Wood's work has appeared on MTV, The New Standard and Jackson State University’s art exhibit, “Other Heroes: African American comics creators, characters, and archetypes.” He is a 2007 Glyph Comics Award nominee for ‘Rising Star.' Available now at Lulu.com!